Once upon a time; we saw a picture on the internet entitled "A Game of Life and Death" where the God of Life played a game of cards with the God of Death. They played to decide whether the deceased would be going to Heaven or to Hell. They played with a deck of Death Playing Cards; of course! Now you can possess a deck of playing cards inspired by those used only in the afterlife. If they really exist; this is what they would look like. Welcome to Death Playing Cards. 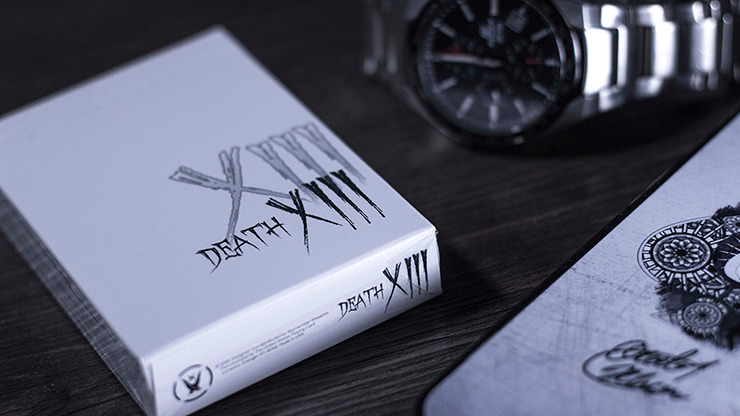 The Death Playing Cards feature a custom Ace of Spades, custom Jokers, a blank face card, a double face card, a custom tuck box and a seal. Designed by Skymember Presents; these cards are printed by The United States Playing Card Company(USPCC) in Erlanger, KY, USA. SUPERB limited quantity; only 1200 units were produced! Once they are sold out; we will never again reprint them. Get ready to witness the only playing cards that will be used in the afterlife. Deck Flip, Le Paul Spread, Squeeze by Daren Yeow, Sybil Flicker, Nova by Avi Yap and Skymember Presents, Paint Brush Change, Cardini Change, Clipshift by Chad Nelson and Dan & Dave Buck, Erdnase Colour Change, Vector by Patrick Kun, Diving Board Double by Lee Asher, Revolution by Gregory Wilson and Murphy's Magic Supplies, Be Kind Change by Tony Chang and Theory 11, Haunted 2.0 by Mark Travesoni and Peter Eggink presented by Paul Harris, Shadow Splitter by Hui Zheng presented by Rick Lax, Lumix by Shin Lim, Anaconda by Bone Ho and Virtuoso, and Swivel Steal. Disclaimer: The featured deck in the trailer is the prototype. Therefore, the actual color, finishing, and the quality of the playing cards are different from the prototype. Please check the official photos for the details.